Everything worked out and I stayed safe. I was just happy that I caught the accidentally dirty dish! Has anyone else ever been caught in a situation like this? Share in the comments below! Combine dry batter ingredients and mix. Add wet batter ingredients in and mix. In a separate bowl, mix streusel ingredients. 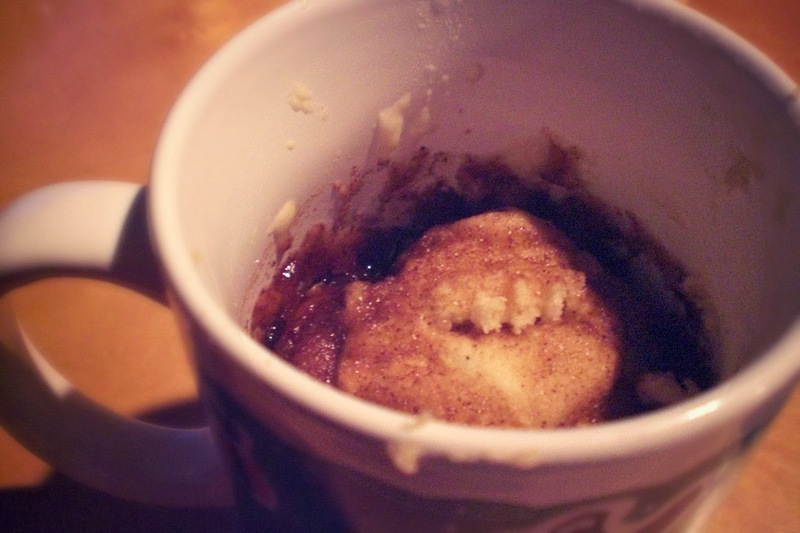 Put half of batter in the mug, then layer on top half of the streusel. Add the second half of the batter, and on top of that the other half of the streusel. Bake in the microwave for about 1 minute. However, the time may vary depending on your microwave, so add 10 seconds on until you find it desirable. Please remember to double check all ingredients for your food allergens. Enjoy! “What do you eat?! ?” is a question I’m commonly asked. But to me, living with food allergies isn’t about what I can and can’t eat, but the attitude with which I handle them. I’ve been living with food allergies ever since I was diagnosed at 4 months old. Yet within my life, I have never once gotten out of bed with a groan thinking that it was just going to be another day where I couldn’t eat like everyone else. Granted, I’ve woken up groaning due to bio tests or a long day of chores ahead of me, but I promise, never because of my food allergies. How have I done it, you ask? I just realize that there is more to me than just being “The Girl with Food Allergies”. I just take a step back and remember who I am. I sometimes can’t believe I’ve grown up so fast. I walk/skip around my house (okay-in public too) singing because it makes me happy. I enjoy going for walks to take in the beauty around me. I capture single moments of that beauty with my camera. I’m pretty much obsessed with photography. I love acting in my school musicals and Shakespeare club, along with summer shows. I enjoy teasing my little brother at every chance I get. I miss my sister in college and enjoy the time and laughter I share with my other sister who’s a senior in high school. I love my parents and always hope that I am making them proud. I’ll go through everything and anyone to help and protect my friends. I’m easily scared. Really easily. I’ll hear my sisters sneaking up behind me and still jump a mile when they say “boo”. I’m 4’11” (and ¾”!) I pretend to be annoyed by short jokes, but really I find them just as funny as everyone else. And I like french fries. I can quote practically all of Nemo and Up (along with many other Disney Pixar movies) and I am not ashamed. I’m a “hiding-under-the-covers-flashlight-on-promising-myself-to-read-only-one-more-page-until-2am” kind of girl. I think sunrises and sunsets are the most beautiful things a person can witness. I speak up for what I believe in. And I’m loud…now that I think about it…probably too loud. I love boating on the ocean. I love the sound of the waves splashing against the hull of a boat, the smell of the salty air, and the wind whipping around me. I set goals and work hard day in and day out to reach them. Everything I create or do has to be done a certain way…I guess I’m a little OCD. Well, not yet… but I hope to be! I imagine what my life will be like in 30 years, and what it will be like tomorrow. I wonder what its like to fall in love and wonder when I will and who it will be with. I hope for a love like my parents’. I always look at the bright side of any situation. I ignore what other people say about me because I am happy with who I am. All these aspects make up who I am- NOT just my food allergies. Don’t get me wrong, my food allergies are a huge part of me; without them I would not be where I am today. I’ve found real friends and people that I know care about me because they are careful with my food allergies. I’ve learned to stand up for myself; my food allergies have given me confidence I never would have had otherwise. 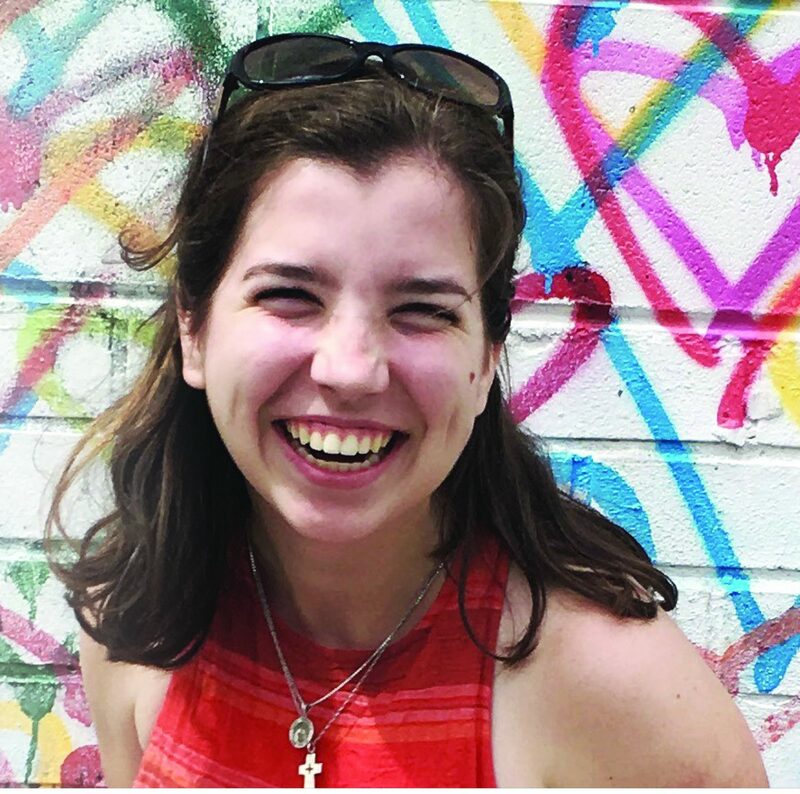 I’ve learned how to help others by helping them understand their food allergies through my blog and by being a member of FARE’s Teen Advisory Group. I raise awareness by incorporating my allergies into school assignments. I’ve done a presentation on the FAAN/ FAI merger into FARE, and I’ve even written a poem for my English class (Never Make Me Cry) about living with food allergies that brought strangers to tears. When I’m asked the question, “What do you eat? !” I never once think that I’m lacking anything in my life. I never let this question get me frustrated or upset. Because I know that I express myself and live with my food allergies by doing what I do best. After 15 years of living with food allergies, you would think that I would know exactly what brands I am and am not allergic to. And you would be right. Generally, anyway. However, this belief that I know every single brand that is and is not safe has given me a false sense of security. Friday night, I was cheerleading at my football team’s game at a field an hour from my home. A parent brought bags of chips for us girls to eat during halftime since we were missing some girls and therefore weren’t able to perform our halftime dance. I grabbed a bag of chips that I’ve had frequently in my school cafeteria. I read the ingredients at the beginning of the school year and they were safe. I ate them quickly in my hunger, but almost immediately upon completing the bag, my tongue got itchy. Believing that the chips were safe, I hoped that it was nothing. But following my instincts, I checked the ingredients again anyway. My heart stopped when I read “Contains: Milk” in dangerously bold letters. I asked my friend sitting next to me if these chips had always contained milk and when she responded yes, I was befuddled! How could something that I’ve eaten so many times before, believing them safe and never having had a reaction to, all of a sudden cause me to react? The situation complicated when I realized I had moved all my medicine from my cheer bag into my work bag, and forgot to put them back after work. I went up to my coach asking if our first aid kit had any Benadryl, and it didn’t. We then looked through the football team’s med-kit and still, nothing. Fortunately, one of the parents in the stands had overheard the issue and had Benadryl in her car. I ended up taking two pills. At this point I had a stomach ache as well. I called my mom, who was over an hour away picking my sister up, and informed her about the situation, but was confident in telling her I was fine. And fortunately, I was. By the end of my game, about 30 minutes later, I felt fine. On the bus ride home, I was completely knocked out by the dose of Benadryl, but I felt 100% better when I woke up back at the school. What has this reaction taught me? Never trust any brand, no matter how many times you’ve eaten it in the past. You could have misread and got lucky, like I did, or the company could change the ingredients without any notice. I had a false sense of security when I opened and devoured that bag of chips. By the end of the bag, I realized that nothing is ever 100% safe. Post-Note: I was able to determine with my friends that the brand of chips that I reacted to at the game is different than the brand that I always have safely in school. They both have similar packaging and that’s what confused me.